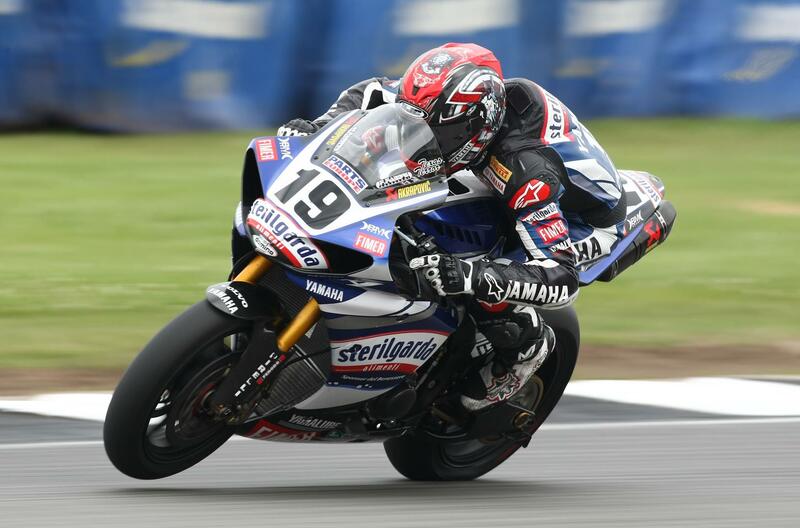 Ben Spies took a lights to flag victory during race one at the ninth round of the World Superbike Championship at Donington Park in the UK. The Yamaha riding American was never headed and his nearest rival was Max Biaggi aboard the Aprilia who got close but was never able to put a move on him. Biaggi had a problem on the final lap just as he exited the Esses, his engine cut out but he managed to get it going again and came over the line in second place. The final step of the podium when to the Championship leader Noriyuki Haga on the Xerox Ducati. He had a lonely race to third place with no one any where near him on track. On the British front it was Leon Haslam on the Stiggy Honda who finished in fourth place just ahead of Shane Byrne on the Sterilgarda Ducati. Jonathan Rea was seventh aboard his Hannspree Ten Kate Honda. Leon Camier scythed his way from 21st on the opening lap to 13th while his Airwaves Yamaha team-mate James Ellison got as high as 11th before crashing out at McLeans. Tom Sykes, team-mate to Spies, also crashed out of seventh place when he hit a bump at Goddards and lost the front. Straight after the race he went to the medical centre to have some treatment on his back. Race winner Spies said: “Max rode great, I had to ride hard the whole race and we put in some super-fast laps to get into the 30s. I hope he was sliding around as much as I was. Biaggi said: “Congratulations to Ben. He was pushing hard and I was doing my best but he was riding hard to the end.